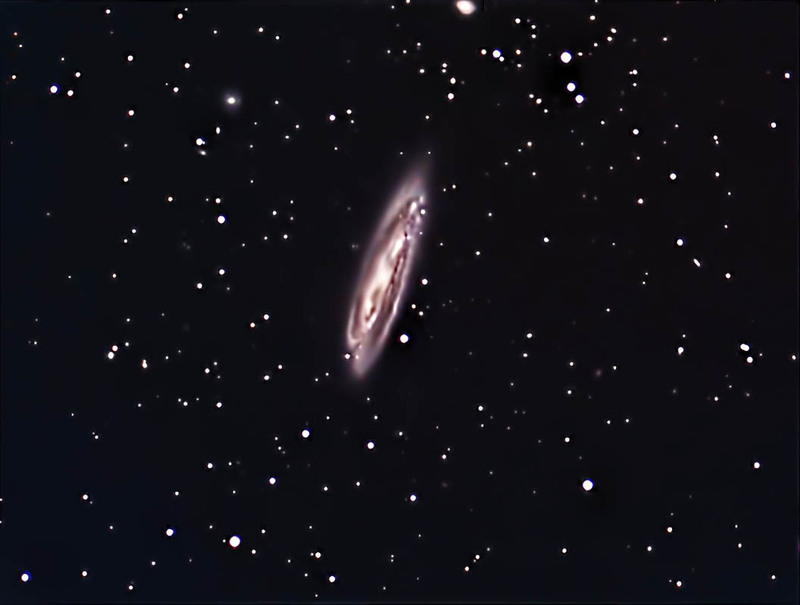 M98 is one of the faintest of the Messier objects. It is a member of the Virgo Cluster. It was discovered by Pierre Mechain in 1781 and cataloged by Charles Messier the next month. This spiral galaxy shows some distortion in its arms. This is beleived to have been caused by a close encounter it had with another galaxy - NGC4254. Another peculiarlity about this object is that is exhibits a blue shift. That is, it is approaching us rather than moving away, as most galaxies are. Exposures: Luminance: 24 @ 5 min. Color: 20 @ 5 min. Luminance images were focused, captured, reduced, and combined in CCDSoft. Color images were focused using the camera's live view function. The raw images were converted in Canon Digital Photo Professional. They were calibrated in Photoshop. The frames were then aligned and combined in ImagesPlus. The Luminance and Color images were aligned in RegiStar. The composite image was created and adjusted in Photoshop. Finally, Topaz DeNoise was applied. Shot from my backyard observatory in southeast Minnesota on 4/18/14 (color images were obtained on6/6/13). Temp: 36F.